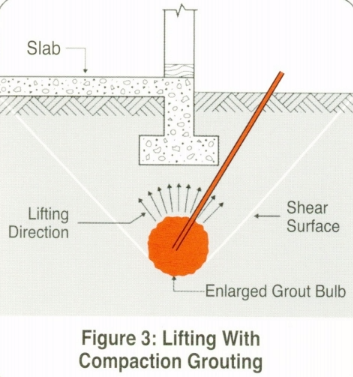 Compaction Grouting is a technique for improving both the density and strength of foundation soils. Compaction Grouting consists of injecting a low-slump, low-mobility, silty sand-cement grout into loose soils at high pressures. Slow injection rates are used to limit soil hydro-fracture and maintain grout control. As it is injected the grout forms a bulb at the end of the injection pipe. As the injection continues the bulb volumetrically enlarges, displacing and compacting the surrounding soils. The intent of the process is to compact loose/soft soils and densify soils. 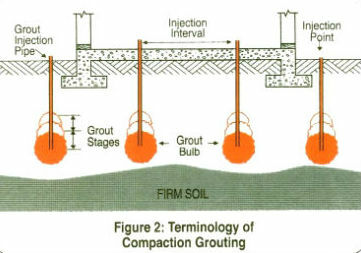 Compaction grouting is a technique for improving both the density and the strength of foundation soils, in-place, by injecting stiff grout through casings that are driven into the soil. As the grout is injected, the grout forms a bulb at the end of the injection pipe. As the injection continues, the bulb volumetrically enlarges, displacing and compacting the surrounding soils, as shown in Fig. 1. 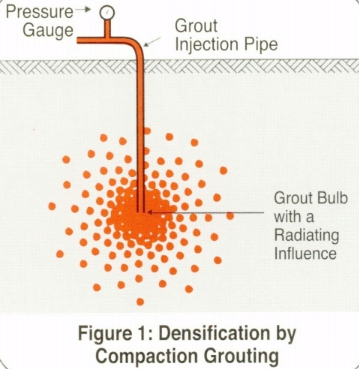 The extent and the degree of soil densification depends on the spacing and the arrangement of injection points, the spacing between injection stages, the consistency of the grout, and the amount of grout injected, as shown in Fig. 2. Hundreds of jobs completed by Geotechnical Stabilization, Inc., have demonstrated that compaction grouting is an effective and economical technique for the in-place densification of soils. Compaction grouting is the answer to many problems caused by the differential settlement of structures. In cases where access to the site with heavy equipment is difficult, and when construction time is limited, compaction grouting can be the only choice for in place densification of foundation soils. The versatility of the technique can be illustrated where access to the interior of a structure or troubled soils is a problem. In these situations, angled injection points can be designed to reach areas below the interior of a structure, or areas that otherwise can not be reached. Compaction grouting can be used effectively for the controlled lifting of foundations, slabs, swimming pools, pipelines, and other structures. Lifting is achieved by the continuous injection of grout beyond the stage where soil densification is achieved. As this point is reached, pressure begins to build within the grout mass. When the pressure of the grout mass exceeds the sum of the pressure of the overburden, the weight of the structure, and the shear strength of the soil cone above the injection point, the soil shears and the grout pressure lifts the soil and the structures resting on it, as shown in Fig. 3. Unlike other lifting methods, both structures and their appurtenances can be lifted and supported on sound foundation soils when compaction grouting is used. Furthermore, compaction grouting allows structures to be lifted and leveled to precise specifications. Compaction grouting can be used effectively to reduce or eliminate the liquefaction potential of soils under existing structures (Fig. 4) or for soils at unimproved sites. For deep liquefiable layers, for inaccessible sites, or for sites where noise and vibration to adjacent structures can not be tolerated, compaction grouting is the answer for soil densification. 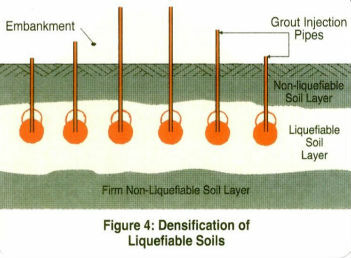 This technique has been used for the mitigation of the liquefaction potential of soils under embankments, school buildings, hospitals, and other critically important structures. As a specialty contractor with nearly four decades of experience, Geotechnical Stabilization, Inc. has helped hundreds of property developers and other commercial clients reinforce their structures against geologic challenges like earthquakes, sinkholes and weather-related conditions. We use a variety of techniques to repair and reinforce your structure’s foundation. Compaction grouting can be used effectively in many scenarios so feel free to contact GSI regarding questions on compaction grouting. GSI offers a full range of geotechnical grouting techniques for ground improvement and foundation repair solutions. We are a trusted specialty contracting firm with over 35 years of experience in the stabilization of existing buildings and the improvement of construction sites. Our staff of experienced and trained engineers has extensive knowledge and experience in soil engineering. We work with home owners, insurance companies, engineers, and developers on residential, commercial and government projects. GSI projects have ranged from individual single-story homes to multi-story buildings and structures of all types. We work closely with our clients in order to provide effective solutions to their structural soil problems. Please contact us regarding questions on compaction grouting | soil stabilization projects.